For more than four decades, the performance of Rotair Industries in the supply and manufacture of quality helicopter parts has made it an industry leader. Sikorsky’s legendary Black Hawk helicopter has celebrated 40 years of military service. The aircraft was first delivered to the United States Army in 1978 and has since been a major part of keeping troops on the front line safe and well equipped. In recent years, Black Hawk helicopters are being used by firefighters as well. Since 2012, the U.S. military’s Black Hawk Exchange and Sales Team has worked to sell around 800 of the helicopters, increasing the use of the amazing aircraft. 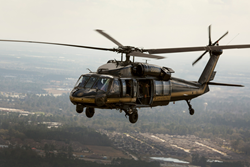 Rotair Aerospace Corporation has been a part of the Black Hawk helicopter’s four-decade story. RAC is a leading force in the helicopter industry. The company manufactures and supplies spare parts across Sikorsky’s S-70/H-60 platforms. RAC’s parts manufacturing includes the UH-60 Black Hawk helicopter. In August 2018, RAC announced a five-year contract with the U.S. Army to provide, develop, and manufacture parts for UH-60 Black Hawk helicopters. The deal is worth more than $5 million and it continues the long-running relationship between both RAC and the U.S. armed forces. RAC also supplies and manufactures helicopter parts for Sikorsky S-61 and S-70. RAC is an expert in the manufacture of complex replacement helicopter avionics, hydraulic, and mechanical parts and systems such as flight controls, bifilar assemblies, and rotor components. These parts are sold to operators around the globe. Today, there are more than 4,000 Black Hawk helicopters in use by military and commercial aviation groups. The legendary aircraft can be found in over 30 countries providing vital work no other helicopter can supply. According to projections, Black Hawk helicopters are expected to be manufactured up to 2070. Its longevity and continued manufacturing are proof of just how important the Black Hawk has been to those depending on it. RAC is proud to build spare parts for such a key military aircraft. Rotair is proud to supply those men and women who protect, serve, and keep America free. For more information on Rotair, please visit the company’s website. For more than four decades, Rotair’s performance in supplying quality helicopter replacement parts has made the company the industry leader. It is a reputation that has come about through a continual strive for excellence in every area of the business. Rotair Aerospace Corporation continues to support the Sikorsky S-70/ H-60 & S61/SH-3 Helicopters each day.